We have made pain relief easy and effective. Professional Therapy MuscleCare Roll-on offers the convenience of applying to those hard to reach areas of the back without using your hands. This product is great for mess-free, quick on-the-go application no matter where you are. The Extra Strength Roll-on is effective in as little as 30 seconds. This helps you to reduce pain and get back to the things you love! 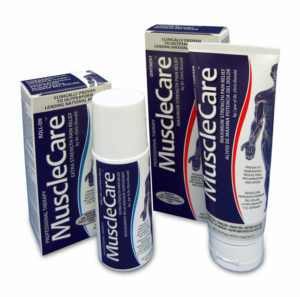 MuscleCare Ointment is best massaged-in for deeper penetration. Ideal for use to relieve pain due to osteo-arthritis, fibromyalgia and chronic pain.